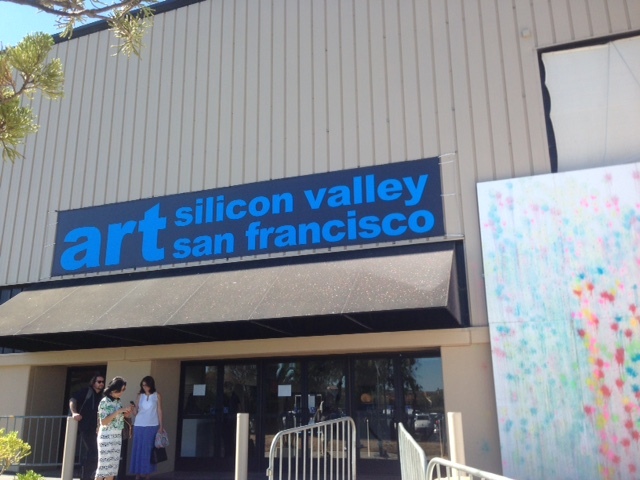 Silicon Valley Art Fair 2015 has all the makings of a successful art fair. I attended the first day, Friday, which had a very solid attendance. In fact I heard from more than a few exhibitors, that in the past, Friday was typically the slow day. They voiced shock and joyful surprise at the boost in this year’s Friday attendance. Indeed if it was anymore crowded it would have been difficult to actually see the work. If this is a precursor to Saturday and Sunday than this year’s fair should have a stellar attendance from the public. Additionally I noticed a bump in the producer’s of the show, Art Miami LLC, marketing and social media presence. Not to say that they don’t have more work to do – but they delivered a marked improvement in their social media marketing from last year. SV Art Fair is a solo venture, unlike the other shows Art Miami owns (Art Miami, CONTEXT, and Art Aqua) which all happen in the sunlight of Art Basel, SV Art Fair does not ride the waves of other satellite events. This is a herculean task with regards to pulling in attendees, off-setting costs, and partner possibilities for sharing traffic. There was a total of 54 gallery exhibitors (not including special exhibitions) which is a notch down from 2014 which had 69 exhibitors. SVArt Fair filled out the floor with a “partner” booths that included: SFADA; Stanford Art Spaces; TMORO projects; UC Davis Art Studio; Shipyard Trust For The Arts (STAR); Yerba Buena Center for the Arts; and San Jose Museum of Art. I applaud this connection with local non-commercial venues, but for collectors and artists there is still a need to grow the exhibitors list. The show is not large, in fact in comparison to their other events it felt very small– it took us an 1.5 hours to give all the booths a thorough look. 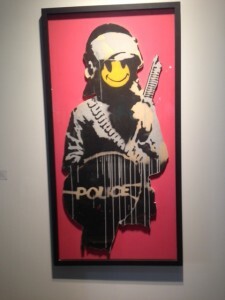 Some of the galleries brought some stand out art that hopefully savvy collectors picked up. 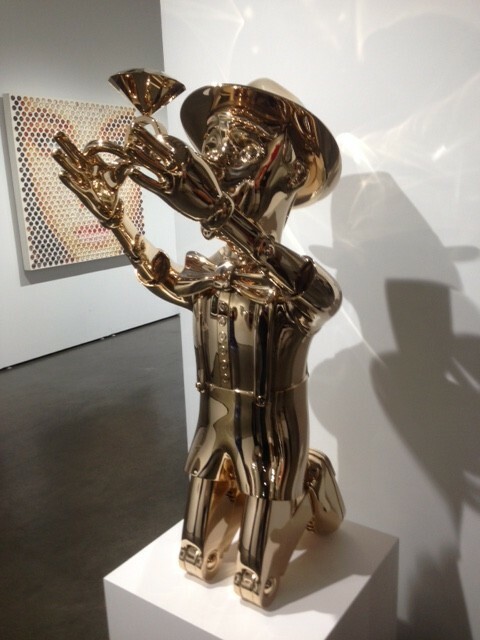 Joseph Klibansky’s polished bronze “Reflections of Truth” is beautiful and poetic. 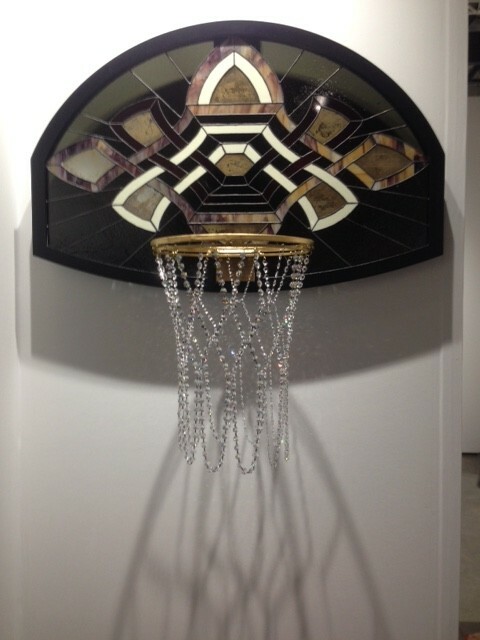 Victor Solomon’s Stained glass backboard and chandelier net. Pure genius! 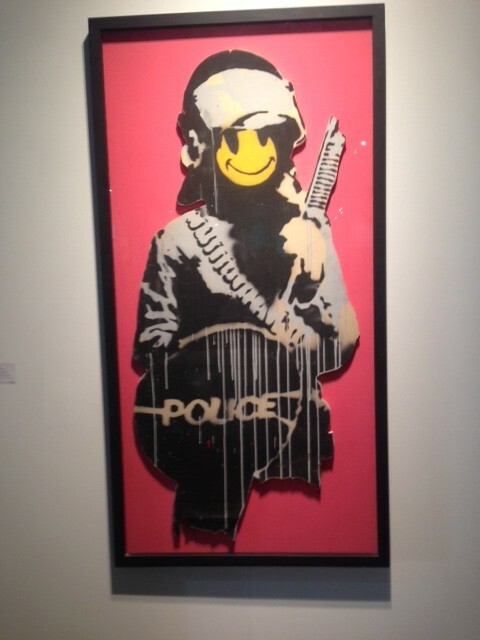 Of course a modest Bansky was available as well as a booth of Mr. Brainwash works. Their was also a focus on connecting with engineers and programmers by presenting art that uses electronics and digital technologies as well panels on collecting. My one complaint is that a large portion of the galleries attending chose to bring work that was a bit anemic. I am always amazed when an event is produced in a culturally rich location like the bay area and the gallerists choose to bring work that represents a zeitgeist of mundanity. Many galleries brought work that was, in my opinion, a total yawn. In some respects this may reflect their cautious approach, instead of taking risks, they select work that fits their misguided view of what will sell and that is unfortunately the cream of monotonous expression. Pursuit of the dollar can foster a wave of mediocrity that poisons the fresh waters of art – I expected the galleries to shine a light on the pulse of art creation not stock the shelves like a sale at Macy’s. Perhaps I am jaded by my own approach to art making and collecting– safe is tantamount to taking sleeping pills. Honestly the world is an interesting place – we are moving at the speed of light in technological advancements, everyday global connectedness increases 1000fold, Oligarchs are drinking cognac from Napoleon’s reserve, and pop culture is being reinvented every 15 minutes – yet some of the galleries brought us artists who are rehashing Marilyn Monroe’s image, 3D photos ala Fleer baseball cards, and innocuous abstract paintings. 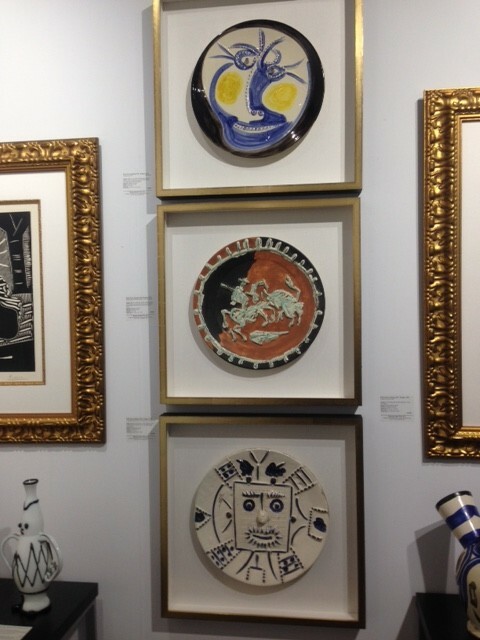 A few of the galleries brought the dregs from Andy Warhol, Eric Fischl and Pablo Picasso. With regard to Marilyn Monroe’s image(and there were multiples of art that used Marilyn’s image): from one artist to another–Stop! just stop. It’s just eye candy, and an old piece of stale eye candy at that. There is no profundity in its use, only malice towards the creative process. It’s just plain blasphemy – try Miley Cyrus or if that is too fresh, how about Lady Gaga? or if you want to be nostalgic try Madonna. Another observation is the lack of bay area gallery representation. I am not really sure what the issue is here. Perhaps economics has a part in it, but my thought is that SV Art Fair should be a key event for bay area galleries. 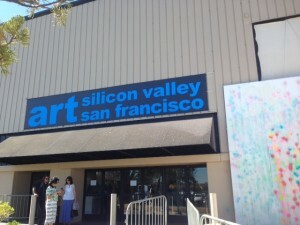 If there is a venue to connect with new collectors from the upper tier inside and outside the bay area – indeed SV Art Fair is one of them. Bay area galleries really should take a look at this fair and consider putting it on their list. There is high value in bay area, national, International galleries and collectors in one location with the great people of Art Miami behind it. I hope that SV Art Fair continues to expand and is able to court the large growing contingent of potential collectors in the bay area and beyond. 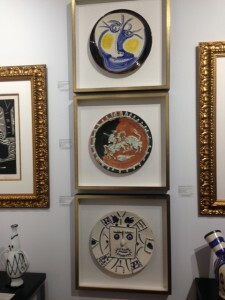 Part of what an art fair does is help educate collectors and provide them with gallery connections that can assist in helping build an informed collection. The gallerists have a grand role in bringing art to the public. They find the artists and act as the conduit and cultural venue evangelizing new directions of creativity, engaging critique and imparting it to collectors. Silicon Valley Art Fair is still finding it’s place among the west coast art scene, but I believe it has the potential to become the premier event. The challenge is for attending galleries to step-up and be fearless in the art they bring and for Art Miami to deliver outreach that attracts collectors who are the top of the pyramid in order to fuel the fair’s growth. Make no mistake, this show is going to grow into a powerhouse. I recommend SV Art Fair as a must attend for galleries, collectors and artists alike.